“They run the stadium like a county fair.” Harsh words from my wife on the game day food experience at Jaguars games. It’s hard to argue that she’s wrong. I’ve been going to Jags games since the Jaguars came to Jax. I was 13 when my teenage dreams came true and we got our own team in my hometown. Back then every Sunday felt like Christmas. My dad would come pick me up in the morning, we would go downtown, walk through all the tailgaters, taking in the sights and smells. You could feel the anticipation. It felt like anything was possible on that field. The excitement in the stands was electric. The stadium was packed, rain or shine, blistering heat or rain pouring down. In the history of the franchise I have missed exactly three home games. I am an eternal optimist. I think you have to be in order to be a Jags fan. Fastforward to last season, 2016. It’s been a decade of losing. I’m a grown man and my dad and I still go to every game together. Jaguar time is family time for us. Owner Shahid Kahn has made numerous upgrades to Everbank Field, and hopefully the team itself. The clubs have been completely remodeled to the tune of $26.6 million. Delaware North Sportservice was brought in as the new food service provider at the beginning of last season just as the renovations were finished. 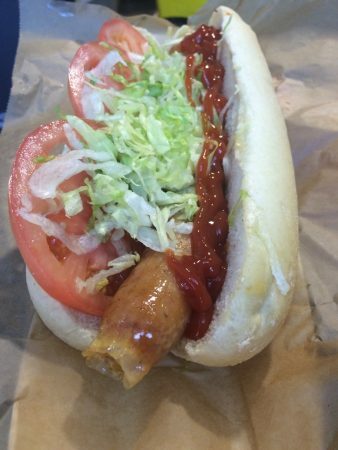 The Jags touted new food options and improvements in quality. Anticipating new and exciting food options, we went to the opening Jags game last year. It did not measure up to the hype. But it was the first game and growing pains are inevitable. By the third week we got our third cheeseburger with unmelted cheese, the fries were unsalted, there was no salt at the condiment station, and no salt behind the counter. 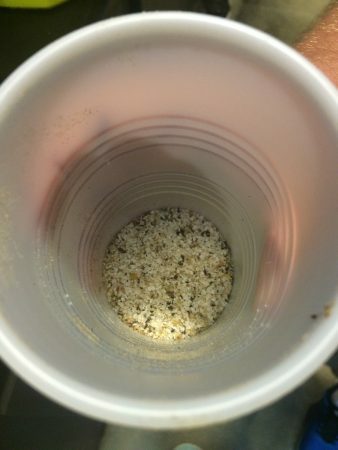 When we begged for salt we were given a dixie cup with some seasoning sprinkled in the bottom, like you might use to season a burger. The “grilled cheese” station used a conveyor belt to run dry bread and cheese sandwiches through, no grilling to be found, the chicken and waffle cone served to us was stale chicken nuggets in a waffle cone, and the gator sausage we ordered had a disturbing looking issue with the casing (It turns out we were served an italian dog of some sort, I found out later). You can draw your own conclusions from the photo. Fed up with the product Delaware North seemed comfortable putting out, I posted a few photos one Sunday on our Facebook account. We fully planned to write a scathing article about the quality of the food and level of the food service. Delaware North reached out to me and asked me to come in and meet with them. The management at Delaware North shared with me that they’d been hired very close to the start of the season and hadn’t really had a chance to do as much training as the cooks they were able to hire needed to perform at the level we all expected. They promised improvement. They had their chefs prepare a variety of the new foods available on gameday for me to try. Of course this wasn’t cooks cranking things out as fast as possible on game day so I was seeing these foods at their very best. Obviously they were quite good and the variety was excellent as well. They did see the immense areas that needed work and were trying to address them. I decided to wait to write in order to give these guys a chance to improve things. I extended that olive branch with one request- just melt the cheese on the cheeseburgers. They told me they’d make sure to remedy that issue. The remainder of the season came and went, painful as it was. For the remaining games my cheeseburgers were 1 for 7 in having melted cheese. Beyond that there were obvious issues with the food and service at nearly every game I attended. As with every off season, I was optimistic about both our team and the food service at the stadium this year. The first game of this season was in Houston. After that game, a hurricane, and a long week of hurricane clean up and power outages across the first coast, it was time for opening day at Everbank. Kudos to the Jags and Mayor Curry for getting things in order in time to host our first home game at home! My family got to the stadium an hour and a half before kick off. It was opening day and we were pumped! A few years ago we upgraded from seats in the general bowl to the East Club. As we walked in we noticed right away the variety of food options in the club was half of what was offered the previous year. All of the fun stuff from sushi, to carving stations, to salad stations, to raw oysters was gone. We thought, “well I guess they must have decided they needed to cut down on options in order to focus on doing the basics really well.” My wife and I went to get burgers. My dad and my aunt went the other way to get hot dogs. There were only a couple people in each line at the Bubba Burger stand. We went down to the end where there was no line. The options were straightforward. We ordered a burger basket and a bacon cheddar burger basket, a bottle of water, and a souvenir soda. The woman taking our order scrolled up and down, up and down, up and down the screen and couldn’t figure out how to put in our basic order. It took 5 minutes and her calling a manager over for our order to be put into the computer. She called out for a burger basket and a bacon burger basket. We moved to the side and waited. A few minutes passed and another man come over to the end to skip the 2-3 person deep lines in the middle. He ordered a drink. The young woman rang him up for a souvenir cup, verified that’s what he wanted, and he said he just wanted a regular cup. She scrolled and scrolled on her screen trying to figure out how to fix it. After another couple of minutes passed the man said, “Nevermind, you’re too slow,” and snatched his $20 bill out of her hand. She was naturally flustered. We nicely asked for our burgers again. This young woman asked the guys expoing for our burger baskets three separate times, while other burger baskets were going out at other registers. It ended up taking 20 minutes to get our food after we had placed our basic order. And this was only after I made eye contact with the cook and loudly but as nicely as I could told him we’d been waiting 20 minutes for a cheeseburger. And they didn’t even get the order right. We got two bacon burgers. 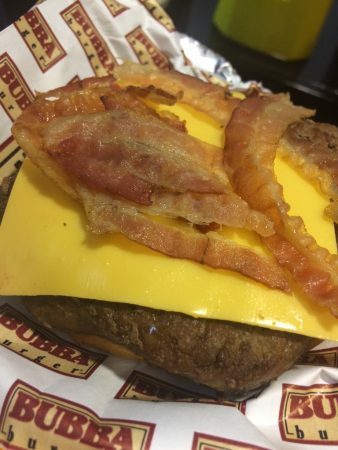 The cheese was miraculously melted, but the bacon was virtually raw. The fries were unsalted. There is no salt on the condiment counter or anywhere to be found. I knew this was coming because during the preseason I asked for some salt and was told, “They don’t allow us to have salt back here.” Whether that’s accurate or not, let that sink in. Someone who is serving burgers and fries has no salt, has no way to get salt to a customer, and tells a customer what he’s been told about salt access. It’s salt, not caviar. 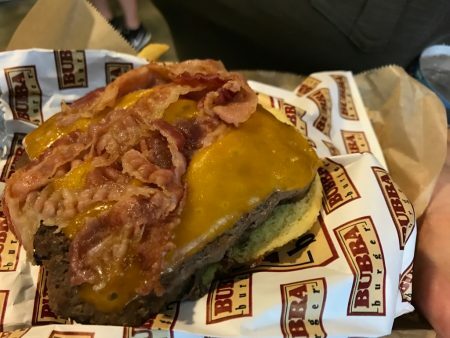 Everbank Bacon Burger 2017- At least the cheese is melted. Meanwhile, my dad and my aunt went to the hot dog stand. My aunt ordered a corn dog. I will let the picture speak for itself. Everyone loves a good corn dog, but only if the product does not resemble roadkill. That was a wow moment in the worst kind of way. I can’t believe my aunt didn’t hand it back to them. My dad ordered and paid then waited 15 to 20 minutes for his hot dog before he was told they were out of hot dogs. Say what? At this point it was about an hour before the game kicked off and the club was not even halfway to capacity. He asked for his money back and was told there wasn’t a manager at the stand but they’d go find one. It took 40 minutes from the time he ordered before he got his money back. Forty minutes! It was at that point that I posted a photo of the corn dog on Instagram. This silliness was out of control. Last season my dad and I went to every relevant bowl game in Florida and experienced the stadiums and food all over the state. Everbank field is a beautiful and comfortable place to watch a game. However I can say without question that our stadium has the worst food and food service of any major stadium in Florida. 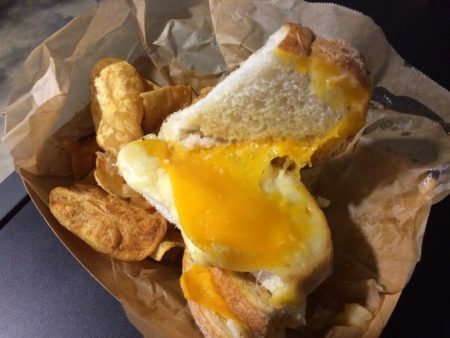 Why is it so hard to get edible food at Everbank? Why is everyone behind the counter so confused about the process? If Delaware North wants to improve their reputation and effectiveness, they should start with communication. There is a chasm of communication breakdown between the management and the people who are carrying out the jobs of cooking and serving customers on Sundays. Managers are nowhere to be found. Cashiers have never read the menus nor seen the software they’re using. There is no salt to be found. I run the largest food blog in Jacksonville and I have had multiple conversations with Delaware North executives, and I am frustrated. 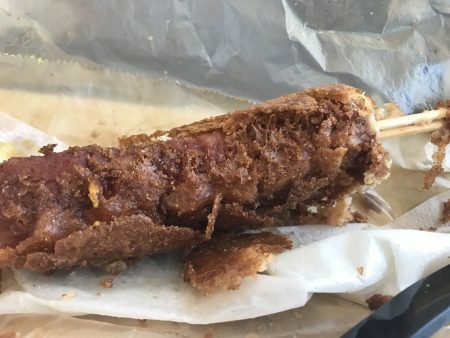 How much more frustrated is the rest of Jacksonville who has no access to anyone at Delaware North, when all they want is an edible corn dog? I will always be optimistic about my Jaguars, but I’m having a hard time being optimistic about Delaware North’s food service. I hope they change my mind. Tagged Alcohol Serving, american, ball park, ball park food, Beer (Breweries and Restaurants), Jaguars, quick service, Serves Alcohol, Stadium, stadium food. Bookmark the permalink. You have to wonder what the peasants that are not in the club area are being fed. For the prices they charge they should be using Kobe beef. Noticed have the foos areas right away! And people who are not season ticket holders but pay to come sit on stools. Way too crowded! We aew in the west club seats. Where,s the Bubble Bar??. They need a field trip to Dallas to see what club holders like to eat and drink. The Bubble bar standing room only and actual sold out of sparkling rose. Food at the Jags more like the boardwalk or Coney Island. I’m not sure exactly what percentage of the stands are this way, but several are ran by volunteers/ organizations. I know this because my work place does this. What happens is we go through a less than one day training (ours wasn’t at the stadium) that mainly focusses on the alcohol serving policies. The group works the stand and gets a percentage of the profits for their organization. The workers you are seeing cooking and serving food, it could very much well be their first time in the stadium. EAT AND DRINK BEFORE YOU GO TO THE SHOW!!! We attended the Diana Ross concert last night- our second visit to your venue. Our tickets were in section T1, and at first were very excited at the prospect of enjoying $50 worth of “complimentary” food and drink in such a convenient location. Upon arrival, our excitement turned to complete disgust and disappointment. We attempted to order a glass of wine, but were told that was not included with my ticket. We then attempted to order a mixed drink, but that was also not included either. We don’t really care for beer, but ordered a $9 bottle of Michelob Ultra so as to try and attempt to get a better value for our money rather than order a small $6 BOTTLE OF WATER?!?! Are you aware that the St. Augustine Amphitheater and the Ponte Vedra Concert hall put care for our environment over outrageous profit with “Green Hands Stations” that allow patrons to refill empty containers they bring in with clean, cold filtered water FOR FREE?!? In a newly built venue such as yours- I would at least expect an effort be made to include cutting edge environmental solutions. However we were happy to note that you do recycle whereas the Florida Theater and the Times Union Center do not. Your food choices are extremely limited, and after viewing them, we would have much preferred to just grab a hot dog, but no- the hot dogs cannot be purchased with my voucher. Your sushi did not appear very fresh to me, nor did it seem to be stored at the proper temperature. We chose the so-called “carving station” for $18- which to anyone who has ever attended a social function in the past, implies there is an actual whole, real turkey breast in the vicinity being carved from. But not at Daily’s Place! Trays of pre-sliced, salty, overly processed turkey are brought out. The portion size is about the same size as a small frozen Lean Cuisine dinner, and frozen dinners are actually much more tasty. The green beans were fresh and relatively al dente, but the potatoes were flavorless and mushy and also too highly seasoned. The sign announcing the choices clearly stated that cranberry relish was to be served along side, but you’d already run out of it. You snack options are equally insulting. A TINY bag of popcorn, the very same that my Ace Hardware on San Jose in Mandarin gives away in UNLIMITED QUANTITIES ALL DAY LONG FOR FREE was $10?!? Candy apples are $14?!? A stale chocolate chip cookie that tasted like it came from a premade, low quality ingredient mix is $5?!? TWO skinny little chocolate covered pretzel logs are $5?!? The queues we had to wait on were interminably long, and I assure you the conversations with my fellow patrons mirrored my dismay at the food choices and quality as well as expressing sticker shock over your insanely greedy pricing!!! I have been to literally HUNDREDS of concerts in my lifetime- and for such a newly built amphitheater I expected A LOT more from you, especially since it’s being run by an organization with many supposed years of experience. SHAME ON YOU!! !